Definition at line 267 of file SparseSheet.h. Definition at line 289 of file SparseSheet.h. Definition at line 117 of file SparseSheet.h. 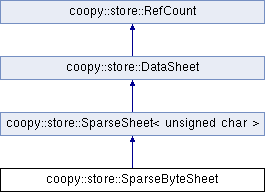 References coopy::store::SparseSheet< T >::col, coopy::store::SparseSheet< T >::data, coopy::store::SparseSheet< T >::row, and coopy::store::SparseSheet< T >::w.
Definition at line 101 of file SparseSheet.h. References coopy::store::SparseSheet< T >::data, and coopy::store::SparseSheet< T >::w.
Referenced by cellString(), and operator()(). Definition at line 109 of file SparseSheet.h. Definition at line 272 of file SparseSheet.h. References coopy::store::SparseSheet< unsigned char >::cell(), and coopy::store::IntSheet::int2string(). Reimplemented in coopy::store::mdb::AccessSheet, coopy::store::CsvSheet, coopy::fold::FoldedSheet, coopy::store::PolySheet, coopy::store::EscapedTypedSheet< T >, coopy::store::gnumeric::GnumericSheet, coopy::store::mdb::JackSheet, coopy::store::remotesql::RemoteSqlSheet, coopy::store::socialcalc::SocialCalcSheet, coopy::store::sqlite::SqliteSheet, and coopy::store::EscapedTypedSheet< std::string >. Definition at line 90 of file DataSheet.h. Reimplemented in coopy::store::CsvSheet, coopy::fold::FoldedSheet, coopy::store::PolySheet, coopy::store::gnumeric::GnumericSheet, coopy::store::mdb::JackSheet, coopy::store::remotesql::RemoteSqlSheet, coopy::store::socialcalc::SocialCalcSheet, and coopy::store::sqlite::SqliteSheet. Definition at line 111 of file DataSheet.h. Reimplemented in coopy::store::CsvSheet, coopy::fold::FoldedSheet, coopy::store::PolySheet, coopy::store::EscapedTypedSheet< T >, coopy::store::gnumeric::GnumericSheet, coopy::store::mdb::JackSheet, coopy::store::remotesql::RemoteSqlSheet, coopy::store::socialcalc::SocialCalcSheet, coopy::store::sqlite::SqliteSheet, and coopy::store::EscapedTypedSheet< std::string >. Definition at line 121 of file DataSheet.h. Definition at line 71 of file SparseSheet.h. References coopy::store::SparseSheet< T >::col, coopy::store::SparseSheet< T >::data, and coopy::store::SparseSheet< T >::row. Definition at line 147 of file SparseSheet.h. Definition at line 138 of file SparseSheet.h. Definition at line 156 of file SparseSheet.h. Reimplemented in coopy::store::mdb::AccessSheet, coopy::fold::FoldedSheet, coopy::store::PolySheet, coopy::store::mdb::JackSheet, coopy::store::remotesql::RemoteSqlSheet, and coopy::store::sqlite::SqliteSheet. Definition at line 266 of file DataSheet.h. Referenced by coopy::cmp::SheetCompare::compare(), coopy::store::PolySheet::hasExternalColumnNames(), and coopy::store::PolySheet::setRowOffset(). Definition at line 81 of file SparseSheet.h. Definition at line 160 of file SparseSheet.h. Definition at line 165 of file SparseSheet.h. Definition at line 58 of file SparseSheet.h. References coopy::store::SparseSheet< T >::h, and coopy::store::SparseSheet< T >::w.
Definition at line 282 of file SparseSheet.h. Definition at line 297 of file SparseSheet.h. References coopy::store::SparseSheet< unsigned char >::cell(). Definition at line 293 of file SparseSheet.h. Definition at line 93 of file SparseSheet.h. Definition at line 85 of file SparseSheet.h. Definition at line 65 of file SparseSheet.h. Definition at line 129 of file SparseSheet.h. Definition at line 277 of file SparseSheet.h. Definition at line 48 of file SparseSheet.h. References coopy::store::SparseSheet< T >::col, coopy::store::SparseSheet< T >::data, coopy::store::SparseSheet< T >::h, coopy::store::SparseSheet< T >::row, and coopy::store::SparseSheet< T >::w.
Definition at line 77 of file SparseSheet.h. Definition at line 30 of file SparseSheet.h. Definition at line 28 of file SparseSheet.h. Definition at line 31 of file SparseSheet.h. Definition at line 29 of file SparseSheet.h.